It happened. Christmas came early for my hubby. I lost my voice. It started yesterday. I could kind of talk, but couldn’t sing during worship service. I taught my cake decorating class, but it was strained. As the evening wore on, it slowly faded until by bedtime, I had nothing left. Not even a squeak. It got so bad that I had to text my husband, who was sitting in the recliner next to me. Of course, he is enjoying this…a little too much if you ask me! Just wait until I get my voice back…I’ll have 2 or 3 days worth of talking to catch up on :). Today, it’s not really any better. I communicate with whispers and over the top facial expressions and body language. It’s been challenging, especially with a 4 year old who doesn’t really understand why my voice has gone away. I have noticed something interesting today. While I was grocery shopping, the employees at the store would tell me hello. I would whisper “I lost my voice” and point at my throat, so they wouldn’t think I was being rude. On every occasion, they would say “Oh! I’m sorry” or something similar, but it would always be in a whisper. Every time I said something to my daughter, she would whisper her response. A cashier at the grocery store said that when he’s on the phone and has to whisper, the person on the other end automatically whispers, even if they’re not in a place where they have to. I updated my status on Facebook and said how funny I thought it was that Sophie will whisper to me in response when I say something. One person commented and said it’s proof that our children live by example. So, that got me to thinking…something you have plenty of time to do when you’re not running your mouth. Our kids learn by our examples. Some of that is good. Some is bad. How do they learn this though? They’re around us. They live with us and observe us on a daily basis. My daughter will say or do something & I’ll think “where did she pick that up?” Then, I’ll quickly realize it’s something I’ve done around her. Does that happen? Sometimes yes. Sometimes, no. Why? Well, I can tell when my kids have been around their friends because they’ll say or do things that I’m not familiar with. It’s usually something that they’ve picked up from their friends, like a new game that they’re playing. It could be a word that our family doesn’t use. It’s not normal sounding…it’s out of place. When we surround ourselves with the world, we pick up things that are out of place. We say things we might not normally say. Things that we know God would never say or do. The problem is that we look and act like the world a whole lot more than we look and act like God. It seems at times we have things backwards. How do we remedy this? We surround ourselves with God. Two scriptures come to mind. “Finally, brothers and sisters, whatever is true, whatever is noble, whatever is right, whatever is pure, whatever is lovely, whatever is admirable – if anything is excellent or praiseworthy – think about such things.” Philippians 4:8. If we stick to these two verses, and surround ourselves with the good things and not conform to the worldly things, we’re going to mirror God and in turn, will know what His will is in our lives. It has been a very busy few weeks. It feels like it’s been forever since I’ve posted a blog on here. Today, we had our last fall baseball game. Unfortunately, our team didn’t end on a win, but they held their own against a very talented team. I was proud of them all :). Tonight I dusted my trusty sewing machine off & used it for the first time in a looonnnnggg time. Boy, did it feel good! 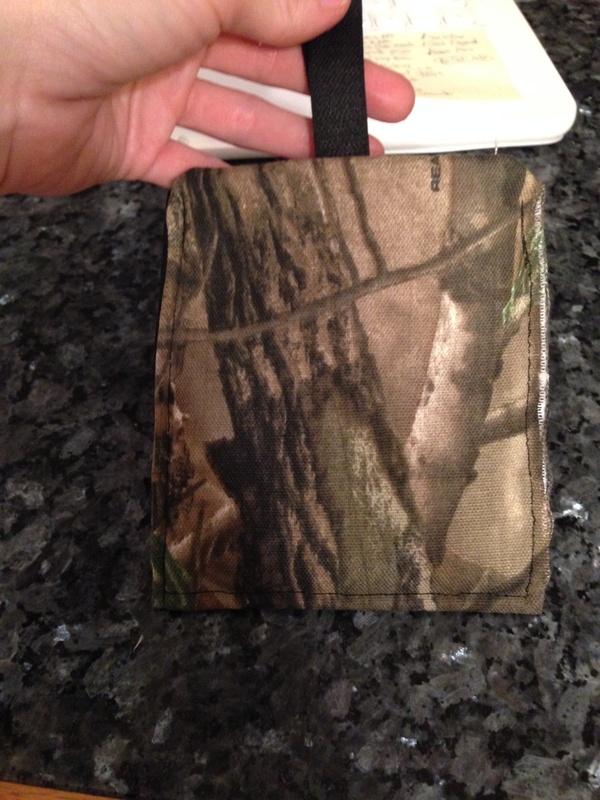 Last year, I had made my hubby a tree stand skirt and several pouches for him to attach to his tree stand…all out of Real Tree camo. I had a lot left because I wasn’t really sure how much I would need for all of my projects. 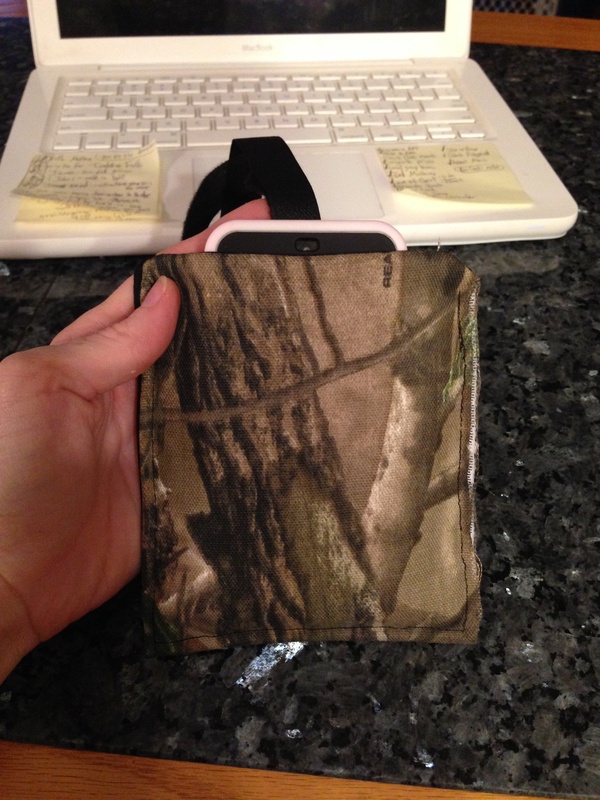 Tonight, my hubby told me that he needed something that he could drop his phone into and that would attach to his tree stand. Just yesterday, I had found this tutorial…amazing! I had to do make some adjustments for the size of our phones. We have upgraded from an iPhone 4 to a 5C (a huge upgrade) and the size is much different. 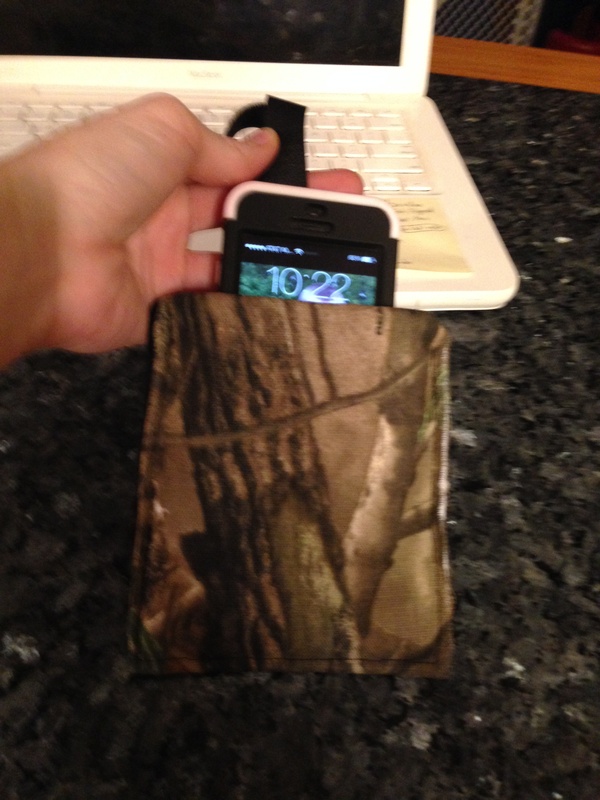 Also, my hubby didn’t want it to fit too snugly…he wants to be able to just drop his phone in with one hand. I had to take into account that we have phone cases on our phones and part of it is made out of a rubbery material. So, I cut 2 pieces of material (one was my camo print, the other was just a plain black piece for the lining) 11 1/2 inches long and 5 inches wide. I made one earlier that was a little narrower than that. It worked, but the phone fit very snugly into it, so it won’t work for my hubby’s scenario. I also got rid of the strap with the key ring. What he wanted was strips of velcro that would wrap around the tree stand bar. I didn’t really measure those. We just eye-balled what we thought would work. I also eliminated the batting because the phone doesn’t need that much protection (plus I just didn’t have it) while in the tree stand. Tada!!! (Not too happy about that right side…not sure what happened. He said he’s not worried about it though). My hubby was very excited about his new phone holder. He said he can’t wait to try it out. In Virginia, you are not allowed to hunt on Sundays (not that he would have a chance to anyways), so he’ll have to wait a few days. We did a trial run. I texted him (his phone was set on vibrate). He received the text, but we couldn’t hear the vibration (sometimes, it seems like vibrate is louder than the actual ring). Hopefully, this will keep him from getting “busted” by a deer and then he can bring home more venison!! I have several really cute projects that I’ll be working on soon for birthday gifts and Christmas gifts. Some I’ll be able to share as I make them…some I’ll have to wait on until after the fact. I am very excited about them though! They should be good ones!!! Have a wonderful Lord’s Day tomorrow!! Well, it’s almost official. In 1 hour and 20 minutes, I will be a hunting widow. I’m practically one right now. Here it is on a Friday night. The kids and hubby are in bed & I’m wide awake. Oh well. Yes, tomorrow is opening day of hunting season. It is a very exciting time in our household. For weeks, there has been scouting, planning, cleaning, repairing, more scouting, more planning. There have been many pictures taken on game cams. Many trips have been made to the woods to find the spot. This is my hubby’s second year of hunting, and boy, have I learned a lot!! I know more about bows and guns and camo than I ever dreamed I would. I know what fletchings are. I know that the tube that looks like a glue stick is not a glue stick…it’s wax for the bow strings. I know if you wash the hunting gear in All or Arm & Hammer detergent, the hubby might not be too appreciative of you “helping out”. I know that hunting laws are ridiculously confusing and change depending on who you talk to. I know waaayyyy too much about deer attractant and thanks to YouTube, know much more about gutting a deer than I ever want to know. I know some wives aren’t too excited about hunting season. I see where it might be inconvenient. Hours upon hours spent away from family. Lots of money is put into getting the proper gear and licenses. However, I have experienced the “fruits of his labor” first hand. I have learned I actually like venison!! Shocker! If you know me, you know I’m a little, kind of, really picky eater. That’s probably putting it mildly. So, imagine my surprise when I made and ate venison for the first time last year. I actually liked it!! My venison supply is running low, so I told my hubby that he HAS to get at least one deer this year. No pressure, right? I’m still not on board with hanging a dead animal’s head up on the wall in my living room, but I have definitely come a long way, immersing myself in the hunting culture. 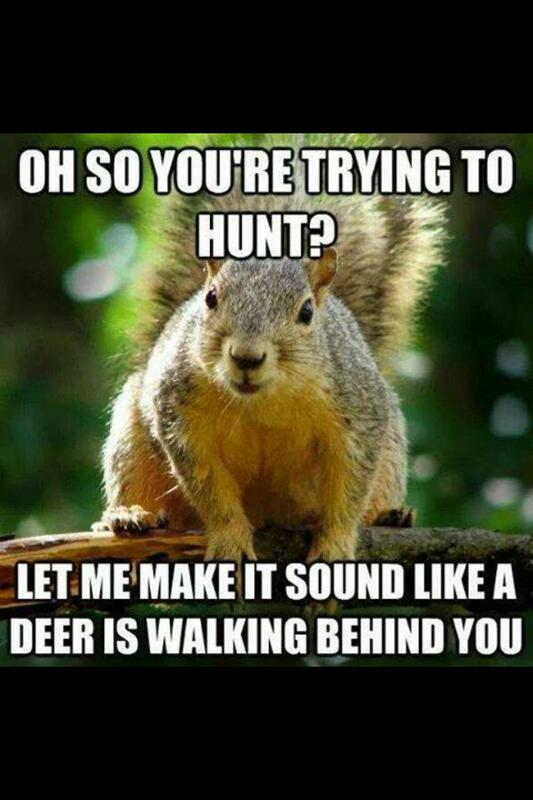 I have to say, my hubby’s not the only one a little, kind of, a lot excited about hunting season starting up. I’m actually looking forward to it almost as much as he is! I know I’ll be hanging on to my phone tomorrow, hoping every text that comes through is a pic of him with the spoils of his hunt. So, to all of you hunters out there…why aren’t you in bed? Just kidding. I wish all hunters out there lots of luck with their hunts tomorrow. May your arrows shoot straight and find your target.